Patricia [Patty] Wolfe left us peacefully, on Sunday February the twenty second, at home with her family. She is survived by her husband Jack, her brother Jim, her son Alex and her son Sam, who is fifty nine years old, autistic, and living in a Devereaux home in Goleta. Born in San Francisco in 1928, she grew up in Los Angeles where she attended Otis College of art and later resided in Berkeley California, where she met and married Jack, her husband of fifty years. They soon moved to the mountains of Taos, and Santa Fe New Mexico, where they lived for twenty five years before moving to Santa Barbara in1999. 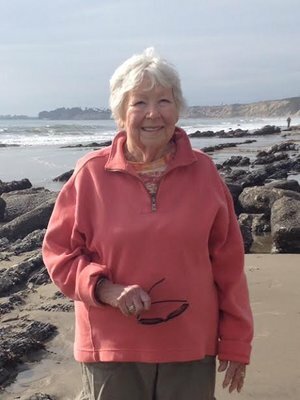 She was a regular, at the Santa Barbara gym, Where she took Pilates, and was known for her sunny smile. She also took figure drawing classes at the adult extension of Santa Barbara city college. As per her wishes, no formal service will be held. We miss her, and hold her in our hearts. Our thanks to the Cancer Center, Visiting Nurse and Hospice Center and the many who have expressed their love and sympathy.